President of the ad hoc Haryana Sikh Gurdwara Parbandhak Committee (HSGPC) Jagdish Singh Jhinda has taken exception to the public criticism of the “shukarana yatra” (thanksgiving march) by some Haryana Sikh leaders, including Didar Singh Nalvi, member of the SGPC and general secretary of the HSGPC, and executive member Baldev Singh Khalsa. Reaction to the reduction in the petroleum prices is on expected lines. While Congress leaders have welcomed it, opposition parties are describing it as insufficient. Owners of stone crusher units of Asia’s “largest” stone crusher zone located in Pali and Mohabatabad villages, near here, have threatened the government that they will take to the streets if it fails to ensure the supply of stones (raw material) to their units. Eight students of Akal Academy, a CBSE-affiliated senior secondary school in Ratia town here, threatened to commit mass suicide after the school management finally expelled them today in the middle of the academic year for allegedly trimming their hair. The Punjab and Haryana High Court wants to know the responsibilities of the state towards the children of the convicts undergoing sentence in jails. A Division Bench of the court is also examining whether the convicts are in a position to send money for the maintenance of their children. The Haryana government has earmarked a sum of Rs 431 crore to promote higher education in the state during the current financial year. Besides, a scheme has been chalked out to set up placement cells at government colleges, apart from introducing job-oriented courses at the undergraduate and postgraduate levels. The Haryana government has decided to waive private water connection fee of Rs 500 in villages and Rs 1,000 in urban areas to general category households up to March 31, 2010, under the Indira Gandhi Drinking Water Scheme. Abducted from his house in Sirsa almost 42 years ago and pushed into Pakistan from the international border in Rajasthan by his captors, then youngster, Madan Lal continues to languish in prison across the border. Kurukshetra University has earned the distinction of joining the galaxy of a select club of A-grade universities. Stating this here today, Kurukshetra University Vice-Chancellor RP Bajpai said this was announced by the National Assessment and Accreditation Council (NAAC) in Bangalore yesterday. A large number of persons participated in “Shradhanjali Samaroh” held here today to mark the 23rd death anniversary of Laxman Singh Yadav, a prominent freedom fighter and chief of the Gandhi Brigade of the Indian National Army of Subhash Chander Bose. As many as 12 persons were injured when a cooperative society bus collided head-on with a canter on the Jhajjar-Rewari road near Amadalpur village here today. The injured were admitted to the Civil Hospital here from where one of them was referred to the PGIMS, Rohtak, due to his critical condition. An undertrial was found dead under mysterious circumstances in the district jail here today. The prisoner identified as Jaswant Singh (35), a resident of Kheri Masana village of Jind district, was a proclaimed offender in a case under the Excise Act since 1996 and was arrested by the police only a week ago. Two youths were killed when the motorcycle they were riding on reportedly hit a parked truck on the national highway here last night. The accident took place when the two youths - Parshant Singla and Rajiv Kumar - were on their way to Jagadhri from railway station. Claiming that it was a unanimous decision of the 11-member committee to hold the yatra and both Nalvi and Khalsa were present at the meeting, Jhinda said he was not answerable to them and would reply to the “sangat” at an appropriate time. 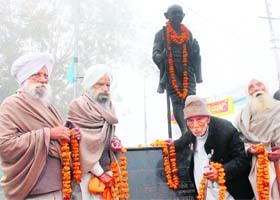 Describing the statements of these leaders as “unfortunate”, Jhinda said the authority to remove or elect any person as president vested in the “sangat” and no individual or group was authorised to replace the president or any other office-bearer enjoying the confidence of the “sangat”. A meeting of the “sangat” would be convened soon once the “shukarana yatra” was over and all issues raised by some HSGPC leaders would be sorted out, he added. Jhinda refuted the charge that he had deviated from the main objective of getting a separate parbandhak committee for Haryana gurdwaras and said the implementation of all decisions taken by the “sangat” was in progress. Maintaining that there was no reason to “abandon or change” the programme of the yatra, Jhinda said such minor irritants would not dampen the enthusiasm of Haryana Sikhs and the 35-day yatra would be a landmark in the struggle for their cause. He claimed that some Akali leaders tried to pressure Takht Hazoor Sahib not to give horses for the yatra and thanked the Takht for not succumbing to such pressures. The yatra would commence from Dabwali, Sirsa, on February 1 as scheduled and culminate at Nadda Sahib in Panchkula on March 6, he added. In separate statements issued here today, convener of the media cell of the Haryana Congress Pawan Jain and chairman of CONFED Bajrang Dass Garg had described the reduction in petro prices as “another pro-people decision taken by the UPA government.” Haryana BJP president Atam Prakash Manchanda and INLD secretary-general Ajay singh Chautala criticised the UPA government for playing a cruel joke on consumers by not reducing the petro prices corresponding to their decrease in the international market. The opposition leaders have also criticised the government for “the meagre increase of wheat price by Rs 80 a quintal.” Manchanda said the increase should have been at least Rs 400 per quintal so that the growers could get remunerative prices. Garg also described the minimum support price of wheat as insufficient and demanded that it should have been increased at least by Rs 200 per quintal. President of the Haryana Janhit Congress Kuldeep Bishnoi said today that the Centre had played a cruel joke on farmers by increasing the wheat MSP by Rs 80 per quintal. Addressing a series of meetings during his programme “Kuldeep Chale Chaupal Ki Aur” today in Pili Mandori, Nagpur, Kulana and Nehla villages here, Bishnoi alleged that the central as well as the state governments were anti-farmers and anti-poor. A delegation of the owners, under the aegis of the Pali-Mohabatabad Stone Crusher Owners Association, expressed concern that the government’s lease for the mining of the Sirohi-Khori hills in the Aravali range, near here, was coming to an end on February 5. Their concern stemmed from the fact that the government had so far not taken any decision with regard to a fresh lease or auction of the hills, which act as a source of raw material for the stone crusher units in the Pali-Mohabatabad zone. Mining in the Sirohi-Khori hills was allowed following a blanket ban on mining by the Supreme Court in a 5-km radius of Delhi. A case for allowing mining on a larger tract of the hills in the Aravalis is pending in the Supreme Court. President of the Pali-Mohabatabad Stone Crusher Owners Association Dharamveer Bhadana said even if the Haryana government was to allow a fresh lease or auction of the hills in Sirohi-Khori for mining, it would take at least more than a year to put everything in place. The reason being that the state government will have to procure clearance from the Union Ministry for Environment. The owners of the stone crusher units fear that the supply of stones to their units will be disrupted. They prefer the Sirohi-Khori hills as they are near to the stone crusher zone in Pali-Mohabatabad. They feel that the prices of gravel and other construction material produced by the units will go up manifold as the raw material will have to be procured from Rajasthan or Bhiwani, which are far off and will raise the transportation cost of the raw material. There are over 160 stone crusher units in this zone. Bhadana said more than one lakh people would be adversely affected if the work of the units was disrupted. Confirming the expulsion, principal of the school Indu Sharma said it was the decision of the chairman of the Kalhidhar Society, the governing body of the school based at Baru Sahib in Himachal Pradesh. She, however, said the students could appear in final examinations on their own. The students - Gurpreet Singh, Gurjinder Singh, Lavpreet Singh, Navjot Singh Shamsher Singh, Gurpreet Singh, Gurvinder Singh and Sandeep Singh - had been shown the door by the school authorities after it was found that they had trimmed their beard and hair. The students were allowed to sit in for the pre-board examinations of the school after they had apologised for their act. However, they were ostracised from other students of their class. After the pre-board examinations ended on Thursday, the students were told to pack up and their names were struck out from the school rolls. A harried lot of parents met the principal as well as the school society secretary, Dr Devinder Singh, who was here today in connection with interviews of staff members, but the school authorities refused to relent. The parents met the local authorities too in this connection, but they too failed to intervene. “The school authorities have bluntly told us to keep our children at home and they will provide the board roll numbers whenever they were received. But, they have refused entry of our children to the classes,” said Gurcharan Singh, whose son, Navjot, is also among the children facing action by the school authorities. “Our children face a bleak future and if the school authorities remain adamant on their stand, the children can take extreme step in desperation,” he added. The parents revealed that the dogmatic attitude of the school authorities had earlier driven a girl student to commit suicide last year. The girl, who was found with a mobile phone, was humiliated by the school authorities and was handed over to the parents to be taken back to home. She committed suicide the next day, alleged Gurcharan Singh. Sharma, while confirming the mobile incident, denied that the girl committed suicide. The girl was suffering from Pneumonia and no one knew how she died, she added. The Punjab and Haryana High Court wants to know the responsibilities of the state towards the children of the convicts undergoing sentence in jails. A Division Bench of the court is also examining whether the convicts are in a position to send money for the maintenance of their children. The Bench of Justices KS Garewal and Sham Sunder is also examining whether the convicts are getting minimum wages in accordance with a Supreme Court judgment in the State of Gujarat versus the High Court of Gujarat case. Taking up the matter this morning, the Bench also asked Haryana Director-General of Police (prisons) to remain present in the court on the next date of hearing. The Bench took up the cause after the plight of Umed Singh and his wife Roshni Devi’s children was brought to the court’s notice. Residents of Dinod village in Bhiwani district, the duo is serving life sentence in a murder case registered on June 14, 2006. The panchayat had informed the court that the couple had six children. Out of the total, four youngsters were staying with their uncle, but were not being looked after properly. The Bench was also of the view that the State of Haryana was not paying the convicts the minimum wages on the basis of suggestions made by the wage fixation body, recommended to be set up in all the states by the Supreme Court. During the course of hearing, the Bench was informed that Rs 55 per day was spent on a prisoner by the government. In an affidavit, Bhiwani District Magistrate M Shayin added the work available in the jails was “scanty”. “There is no hard labour available in the jail factory. The labour assigned to the convicts in the cookhouse is cooking food for the prisoners only. “In the factory, only cloth was woven, which was costing Rs 40 per metre in the jail, but was available at Rs 20 per metre in the market,” the affidavit added. The matter will now come up on February 26. The Haryana government has earmarked a sum of Rs 431 crore to promote higher education in the state during the current financial year. Besides, a scheme has been chalked out to set up placement cells at government colleges, apart from introducing job-oriented courses at the undergraduate and postgraduate levels. This was stated by state Parliamentary Secretary Sharda Rathor at the closing ceremony of the three-day state-level science exhibition at the Government College for Women here today. Addressing students after giving away prizes to outstanding participants, Rathor exhorted them to work hard with dedication to achieve success in life. She asserted that education was on the priority list of the state government. A model school would be set up in each block of the state, she said. Earlier, Rathor laid the foundation stone of a residential colony and a multipurpose hall on the college premises. ML Tayal, Principal Secretary to the Chief Minister, said India had produced a number of eminent scientists. He asked the students to draw inspiration from such scientists. Financial Commissioner and Principal Secretary (Education) Rajan Gupta observed that such exhibitions provided a golden opportunity to the students and helped them infuse team spirit. Higher Education Commissioner Jyoti Arora said 350 students from 112 colleges of the state participated in this state-level exhibition. Earlier, the principal of the host college, Dr Ranjana Lall, welcomed the dignitaries and guests. Local MLA Dharamvir Gauba, DC Deepti Umashankar and Municipal Commissioner Rajiv Sharma and were also present. A spokesman for the Public Health Engineering Department said here today that the scheme was launched by the state government on November 19, 2006, to provide free individual water connections with a 200 litre water tank fitted with a tap to all Scheduled Castes households in rural and urban areas. He said under the scheme 50 per cent concession in the payment of monthly water tariff was also being extended to the Scheduled Castes families. Under the scheme, water connection fee in rural and urban areas for general category households was also waived for one year i.e. up to November 19, 2007. The concession was further extended for another one year i.e. up to November 19, 2008. Up to December 31, 2008, 1,07,292 water connections had already been provided to the SC families. During 2006-07, 19,954 water connections and during 2007-08, 3,51,296 water connections were provided to these families. His tragedy now forms the part of a petition placed before Chief Justice Tirath Singh Thakur and Justice Hemant Gupta. Now in his 60s, Madan Lal is reportedly lodged in Bahawal Nagar jail of west Punjab. Taking up the petition for securing his release, the Bench issued notice of motion for February 25 to the Union Home Ministry. The union government has been asked to file its reply on efforts to get Madan Lal released from Pakistan jail. The petition has been filed by city-based World Human Rights Protection Council through advocate Ranjan Lakhanpal. He had received a communiqué in the matter from the detainee’s brother Suraj Bhan. Lakhanpal said Madan Lal’s abduction case was registered in 1967 itself, but the motive of the culprits, who kept him at Sriganga Nagar before pushing him into Pakistan, was not known. The matter would now come up for further hearing on February 25. Kurukshetra University has earned the distinction of joining the galaxy of a select club of A-grade universities. Stating this here today, Kurukshetra University Vice-Chancellor RP Bajpai said this was announced by the National Assessment and Accreditation Council (NAAC) in Bangalore yesterday. A NAAC team had visited the university in November last year to evaluate the academic performance of the university. Bajpai said the team lauded the commitment and contribution of the university in imparting quality education. Bajpai congratulated students, teachers and other staff of the university on the achievement. Deputy Commissioner Chander Prakash was the chief guest on the occasion and Major TC Rao (retd) presided over it. Paying tributes to Yadav, the DC and others exhorted youths to seek inspiration from his heroic deeds. The DC announced a financial assistance of Rs 11,000 and Rao gave a cash assistance of Rs 5,100 to the organizing committee. As many as 12 persons were injured when a cooperative society bus collided head-on with a canter on the Jhajjar-Rewari road near Amadalpur village here today. The injured were admitted to the Civil Hospital here from where one of them was referred to the PGIMS, Rohtak, due to his critical condition. The bus carrying several passengers was on its way to Rewari. Canter driver Kanha Ram, a resident of Nagore district, conductor Anwar of Hanumangarh district (Rajasthan) and occupants of the bus, including Manish of Ahri village, Dharmender of Chhapar village, Shamlal, Shaudan Singh and Devender of Jhajjar city, Sushila of Khudan village, Rampal of Kahdi village and three others, sustained injuries. The police, on getting information, rushed to the spot and took the injured to the civil hospital from where Kanha Ram was referred to the PGIMS, Rohtak. An undertrial was found dead under mysterious circumstances in the district jail here today. The prisoner identified as Jaswant Singh (35), a resident of Kheri Masana village of Jind district, was a proclaimed offender in a case under the Excise Act since 1996 and was arrested by the police only a week ago. Jail superintendent JS Sethi said Jaswant Singh was present in the morning when the counting of prisoners took place. He took his morning tea at about 8 am. Later, he went to bed and was found motionless when some prisoners tried to wake him up. SDM Harish Bhatia, who carried out inquest proceedings under Section 176 of the CrPC, said there was nothing to suggest foul play outwardly. A board of doctors would conduct a postmortem and the cause of the death would be ascertained only after the report of the examination, said Bhatia. Two youths were killed when the motorcycle they were riding on reportedly hit a parked truck on the national highway here last night. The accident took place when the two youths - Parshant Singla and Rajiv Kumar - were on their way to Jagadhri from railway station. Singla of Jagadhri used to work with the Quality Control Department in Delhi. The duo died on the spot.